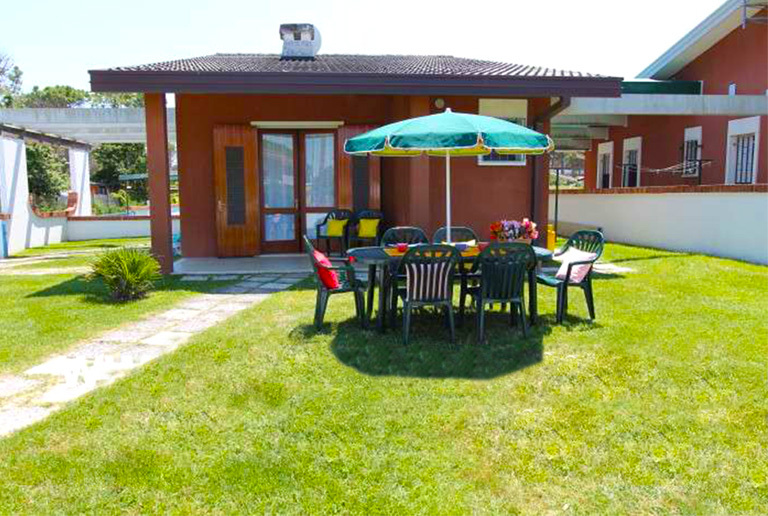 How can I book a flat or a Villa by the Agency Immobiliare Friuli S.r.l? or by fax: 0039 0431 438131. Can I rent a flat only for a few days? Our agency rents flats from saturday to saturday and at least for 7 days. During the low season it is possible to rent a flat with arrival and departure during the week. The price in Euro (per flat and not per person and for a minimum period of one week) includes: electricity, water and gas. The final cleaning is not included in the price. As a promotional present the Agency Immobiliare Friuli Srl offers to its guests the agency assistance and BEACH SERVICE (consisting of 1 beach-umbrella with 1 beach-bed and 1 deck-chair) FOR FREE. In the price is NOT included the tourist tax. Is the beach service included in the price? 1 deck-chair) is offered for free to our guests by our Agency. Fast all of our bech-umbrellas are located in the first rows and directly reserved by our Agency in order to save our clients from standing in a queue for a long time to get their seat on the beach. Do I have to pay an earnest? Yes, 30 % circa of the total rental price is required to secure the reservation ( the lower earnest requested is € 150,00 ). When do I have to pay the earnest? From january to 30th of april within 15 days from the booking date. From may to the end of season within 3 days from the booking. How can I pay the earnest? By money transfer, credit card or in cash. What happens if the client has to cancel his booking? The earnest is not refundable for any reason. Besides, the booking cancellation has to be made at least four weeks prior to the date of arrival. When do I have to pay the balance for the accomodation? Upon arrival. You can pay cash up to 999,00 euro, or with Visa or Mastercard. At the same time you have to fill in the form for the public security, with the list of all persons who will lodge in the accomodation (name, surname, personal information and identification paper or passport). Each person must produce a document: an identity card for the European citizens and a passport for the citizens coming from the non-European Countries. The keys will be handed over only after the complete balance of the rent and the payment of the security deposit. Yes, the balance can be paid also with Visa or Mastercard. Yes , upon arrival you have to pay a security deposit of € 100,00 , which will be refunded upon departure , after that the Agency has determined that no damage has been caused to the accomodation or to its contents , and that it is pefectly clean. At what time can I pick up the keys of the rented flat on the arrival day? Between 4.00 pm and 7.30 pm on the arrival day. Where do I pick up the keys on the arrival day? Arrivals will take place by the Agency Immobiliare Friuli Srl , which is located in Corso del Sole 82 - 30020 BIBIONE Spiaggia ( Venezia ) . May I also arrive in the morning? If you prefer travelling by night , come to our Agency in the morning in order to attend to all the arrival formalities ( documents , information , payment of balance ) . If the flat is already cleaned and controlled , we wil give you the keys immediately . If not , we will inform you by phone as soon as it is ready . We suggest you pack a bag with swimming costumes , beach towels and sun creams so you can directly go to the beach and take full advantage of the first day of your holiday. How will I find the accomodation upon arrival? On arrival , together with the keys you will be given a map of Bibione and all indications to reach your accomodation. Will I find the flat cleaned and tidy on arrival? At what time should I give back the keys of the flat? By and not later than 09.00 a.m. of the departure day. The clients have always to agree with our office on the time of departure for the control of the apartment. On the fixed time ( check out ) , a person in charge will come to your flat to check the general state of the accomodation . If the flat is perfectly tidy and clean, you will hand back the keys and the caution paper to the appointed person, who will give you back the security deposit of € 100,00. How should I leave the accomodation at the end of my holiday? On the departure day the flat must be left clean, otherwise the client will be charged for the final cleaning ( from € 50,00 to 100,00 depending on the conditions of the apartment ). The accommodation must be left perfectly clean, out of rubbish, the cupboards and shelves must be cleaned, the cutlery and all crockery washed, the fridge has to be left empty and defrosted, and the door left opened. The kitchenware must be washed up. In case of dameges the client will be charged for them. Are the apartments provided with a parking place? Yes, most of them have one: some have a numbered car park, others have a parking place in the common area. In the description of each flat is described the kind of parking place. Will I find pots, plates, cutlery and glasses in the accomodation? Yes, all our flats and houses are furnished and supplied with pots, plates, cutlery, broom , scrubbing brush, pail , basin and clotheshorse. For hygienic reasons you won't find in the apartment rags for the cleaning or detergents. Are all your flats furnished with a refrigerator? Yes, most of them are furnished with a middle or a large refrigerator and with separate freezer. Will I find bed linen, towels and a tablecloth in the accomodation? No, our Agency doesn't supply them. You will not find detergents or soap. All the beds are furnished with pillow, mattress, mattress cover and blanket. It is forbidden to sleep without bed linen. In the flat you will find also a waxed bed sheet for children , the use of which is obligatory. Are your flats furnished with a washing-mashine? Yes, in some of our flats there is also the washing-mashine. If you need a flat with washing machine, you have to book it. Can I find any laundries or laundromats in Bibione? Yes, in Bibione there are some laundromats as for example "Lavanderia del Sole" and the dry cleaner "Lilla". Both of them are located in Corso del Sole. Are the accomodations furnished with TV? Yes, in all our flats there is one, in some of them there's also the satellite hook up. Are the accomodations furnished with air conditioning and is it included in the price? Most of our flats have got air-conditioning. If you wish a flat with air conditioning, ask for it by booking. If the air conditioning is not working, you will be given back the difference paid for it. Are the apartments furnished with iron and hair dryer too? No, you have to take them with you. Are the flats furnished with dishwasher? Is it possible to have a cot for a baby? Yes, on request by booking the Agency can supply a cot for free (while supplies last) but without handover , so you must pick it up and hand it back. In some of our flats it is allowed to bring pets upon prior agreement with our staff . Please notice that pets are not allowed on the beach , except for the " PLUTO'S BEACH " ( a beach equipped for dogs ) , which is located in the east side of Bibione , in Lido dei Pini. Have your flats an internet connection? No, they haven't, but in Bibione there are several internet cafes. Can I use an electric fire in your apartments during the low season? No, it is not allowed. We have some flats with heating. If you wish to book a flat with heating, please ask for it by booking. Can I hire bicycles by your Agency? No , but in Bibione there are several shops where you can hire them. In the residences with swimming pool are beach-umbrella, beach-bed and deck-chair available as well? It depends on the Residence; in Residence Valbella you can hire them on the spot. Our Agency doesn't offer this service. If the flat is located far away from the beach , is a beach shuttle available? For most of our accomodations the beach shuttle is available for free (this bus service goes to the beach every 30 minutes from 8.30 am to 7.00 pm, every day). If you are interested, please ask if this service is available for the requested flat. Do the pictures in your website correspond to the accomodations? All the pictures in our website are purely as an indication and are not binding for the Agency. Each accomodation has its own peculiarity (feature), therefore it could be different from the pictures. What should I do when the gas cylinder runs out? If the gas cylinder runs out, please contact our Agency directly. The new gas cylinder will be delivered in a short time; someone needs to be in the flat during the delivery. Please remember that our supplier does not deliver during lunch time and on sunday afternoon. The clients must take care of the rented accomodation (walls, floors, etc. ), of the house equipment (fridge , cooking top , extractor hood , etc.) and of the furnishing (furniture, curtains, etc.). It is strictly forbidden to lodge in the flat more persons than those stated in the confirmation letter. Please note that our Agency can check anytime and without notice the flat condition and the number of persons. What must I do when I am not in the flat for some time? During your absence , please make sure that all garden furniture (deckchairs, sunbeds etc.) are kept inside. The accomodation is not covered by fire and theft insurance; the client will be charged in case of theft. Besides, it is very important to roll up the sunshade (sunblind) to avoid damages in the event of rainstorm or bad weather. In case of damages , the client will be charged for them. Are there some hours of rest to respect? Yes, in Italy, as in all mediterranean Countries , there is a rest time (siesta) to respect : from 1 pm to 4 pm . It is very important that all guests respect these usages and customs , which are written in all the building regulations . In the evening TV and radio must not be so loud , and after midnight the silence must be respected in order to allow all our guests to rest and to spend a quiet and relaxing holiday. Which are the rules of behaviour on the beach? On the furnished beaches it is forbidden to play with the ball or to practice any sports which can disturb the other beachguests, apart from assigned places. It is also forbidden to turn up the volume of the radio or to make too much noise. In the free beaches ( without equipping ) there are no prohibitions but it is good education to do all the possible not to disturbe the other beachguests. In Bibione pets are not allowed on the beach but on the free zone and on the Beach of Pluto (equipped for dogs), which is located in the east zone of Bibione, in Lido dei Pini. It is a good code (regola) also not to push away the beach-bed or the deck-chair from your beach-umbrella and at the end of the day to tidy the beach- material and to shut the beach-umbrella. On the beach there are a lot of dustbins for the recycling and it is very important to use them in order to maintain the beach clean and tidy. It is forbidden to occupy the beach-umbrellas if you have not paid for them. It is also forbidden to lay on the water's edge because it must be left free for the passageway of the people. It is possible to lay on the sun with your beach material only at the bottom of the beach , beyond the beach-umbrellas. Blu = everything O.K., see-bathing is allowed. Yellow = pay attention-reduced watchservice. Red = danger, see-bathing is forbidden. 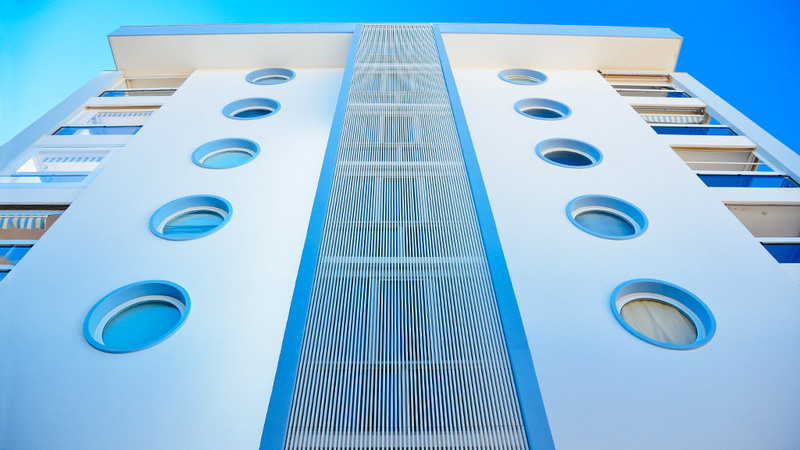 Which is the average temperature in summer and how is the climate in Bibione? In Bibione the climate is mild-warm and the average temperature in summer is about 25° - 27°, exept for some short periods in which the temperature rises to 32°. In may and september the average temperature is about 20°. 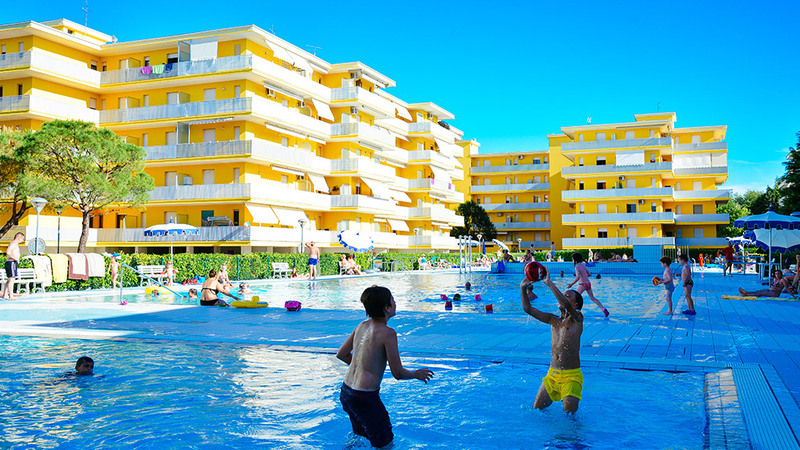 Flats facing the sea, small villas, villages with swimming pools, everyone very comfortable and nice furnished.